State University of New York at Buffalo. New edition of a text for physical therapy students and practitioners on treating hemiplegia. New authors are Sawner and LaVigne. Author of the 1970 first edition was Signe Brunnstrom. DNLM: Exercise Therapy. Sawner, Kathryn A., Lavigne, Jeanne M.
3. Brunnstrom's Movement Therapy in Hemiplegia: A Neurophysiological Approach Sawner, Kathryn A. and Lavigne, Jeanne M.
4. Brunnstrom's Movement Therapy in Hemiplegia: A Neurophysiological Approach Sawner, Kathryn A. and Lavigne, Jeanne M.
5. 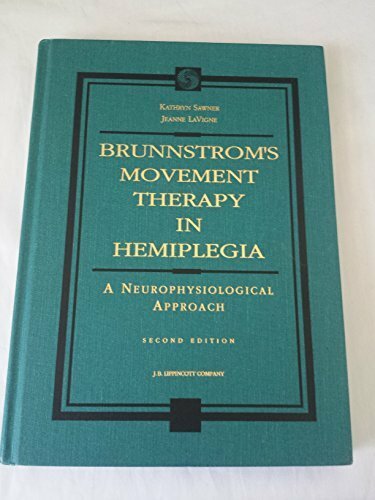 Brunnstrom's Movement Therapy in Hemiplegia: A Neurophysiological Approach Sawner, Kathryn A. and Lavigne, Jeanne M.
Sawner, Kathryn A.; Lavigne, Jeanne M.